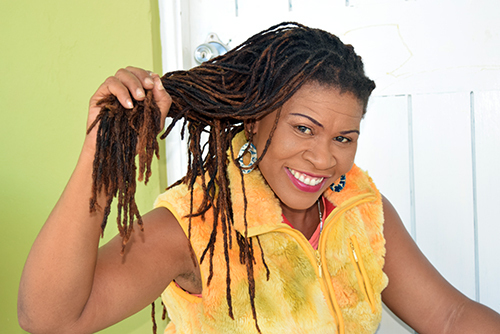 Coming from a musical family, the name Crystal Axe is among the most popular names in the Lucea and Negril areas. She has established the enviable reputation of being among the best female singers, a fact not many can dispute. Born in Central Village, St Catherine, she came to live in Montego Bay at a tender age and attended the Salt Spring Basic School. She then attended the Barracks Road Primary, where she then graduated to the Harrison Memorial High. Due to financial strains, however, the aspiring singer had to be transferred to Anchovy High, where she completed her studies, and then graduated. Though a long and winding road to get to her passion, Crystal Axe benefitted from trying her hand at a few different things, all of which, in some way, contributed to her now burgeoning musical career. It wasn’t quite clear how taking business classes at the New Era Bus Institute, as well as completing an additional business course would land her in singing, but surprisingly, it all did. Crystal Axe went from business to music, and she never looked back. As is customary in the pursuit of one’s passions, Crystal Axe encountered a number of challenges, but she effectively trumped them all. After making it to the Western City, she was soon performing as a cabaret artist at many of the top show venues. Back in Negril, she graced spaces such as Risky Business, De Bus, Alfred’s, Grand Lido, Bourbon Beach and Roots Bamboo. These gigs catapulted her to success as not long after, Crystal Axe landed an overseas gig. Crystal Axe was recruited to sing in a band in West Germany with a group called ‘Seeed’. Her stay in Germany reaped more success when she teamed up with a Montegonian artiste named Black Copper, and that partnership yielded the song which turned out to be a hit, ‘Party On’, which was on the EMI Records label. The song went to number two on the German Black Record Charts, and number 8 on the Top 100 charts. The popularity from that song gained Crystal Axe more recognition as a female Jamaican artiste and from then, the shows kept pouring in. Over the years, Crystal Axe has done some inspiring work of her own. She released several singles, as well as two albums and three music videos, which all reaped a beyond admirable level of success. Some of her more popular songs from her catalogue are ‘Love In My Heart’, ‘Rain Is Falling’, ‘Crying Over You’, ‘So Much Love’, ‘In Yah’, ‘Promises’, ‘Loving You’ ft. Bushman, and ‘Love Me Up’. A testament to her appeal, Crystal Axe has been sought by many musicians, and she has subsequently done a number of features as a result. Her list of artistes she has collaborated with over the years includes Easy Wayne, Ray Dawen, Bushman and Black Copper ,just to name a few. “I got the inspiration from my father, Rueben Brooks, who is also a singer. Music is in my blood. My little sister, Princess Tia, is now on tour also as a singer, and my time is near to restart my tours as I have three songs to release next month. I want to thank the Father up above for showing some success in my musical career,” expressed Crystal Axe, whose real name is Gayamaris’ Brooks. She now sings at the No Name Bar in West End Negril, in the Crystal Axe Showcase series each Thursday.